Gregg Popovich met with Kawhi Leonard amid reports that Leonard wants to be traded from the San Antonio Spurs, according to ESPN. 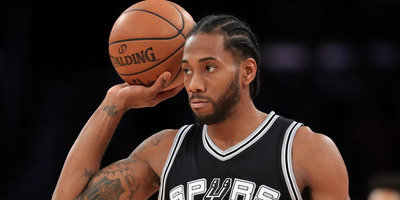 According to the report, Leonard remains upset with the Spurs over their handling of his quad injury and public comments made by Popovich and several players. Such demands are likely to make it difficult for the Spurs to get much value in return for Leonard. The San Antonio Spurs-Kawhi Leonard saga continues to get messier. According to ESPN’s Adrian Wojnarowski and Ramona Shelburne, Spurs head coach Gregg Popovich met with Leonard on Tuesday to reconnect with the star forward, who has grown distant from the franchise. Last week, Leonard’s camp told reporters that Leonard wanted to be traded from the Spurs. ESPN’s report said that Popovich had been seeking a meeting with Leonard for weeks but that Leonard had made it difficult to set one up. ESPN reported that Leonard remained upset with the Spurs’ handling of his quad injury, which led to him getting a second opinion and taking the matter into his own hands, outside of the Spurs’ counsel. Additionally, Leonard reportedly remains upset about public comments from Popovich and Spurs guard Tony Parker about Leonard’s rehab. Popovich frequently referred to Leonard’s “group” when asked about the rehab, and Parker said his quad injury was “a hundred times worse,” though he came back earlier than Leonard. According to ESPN, Leonard would prefer a trade to Los Angeles, with the Lakers being his preference over the Clippers, and plans to tell other potential suitors that he wants to sign there in 2019 when he becomes a free agent. Though the Spurs wouldn’t be motivated to trade Leonard to the Lakers, ESPN said, Leonard’s demands and intentions may make it difficult for the Spurs to get anything of value in return for him, knowing he wouldn’t re-sign with them in 2019. For the Lakers and the Clippers, knowing they might have a shot at Leonard in 2019 means they might not be motivated to trade for him in the first place. The Spurs still don’t have to trade Leonard to the Lakers or the Clippers; their options are just diminished. Some contender may take a shot on a one-year rental for Leonard – similar to what the Oklahoma City Thunder did with Paul George – but they won’t give up much in return. The Spurs are in a position to take the best deal and be done with it, but the value of the best deal changes if Leonard is making his plans clear.